IMPROPER USE, CARE AND INSPECTION COULD RESULT IN SEVERE PERSONAL INJURY OR DEATH. INSPECT ALL TIE DOWN ASSEMBLIES EACH TIME BEFORE USE. DO NOT USE ANY TIE DOWNS THAT ARE DAMAGED, CUT OR WORN. 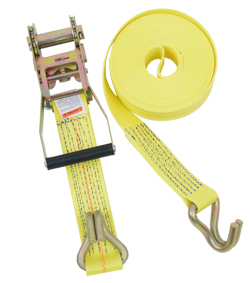 ALL TIE DOWNS ARE LOAD CONTROL DEVICES AND ARE NOT TO BE USED FOR LIFTING, LOWERING OR SUSPENDING. CHECK ALL REQUIREMENTS AND LOAD LIMITS BEFORE CHOOSING TIE DOWN WITH APPROPRIATE HARDWARE. NEVER TIE KNOTS OR USE WHEN KNOTTED. PROTECT TIE DOWNS FROM SHARP OBJECTS.